A Handbook for anyone going through life. 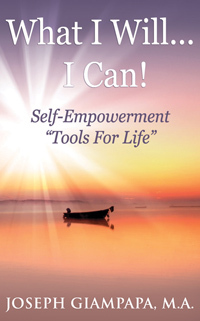 This powerful little book was specifically designed for anyone desiring a better quality of life. It’s a short and concise “Guidebook” embracing our individuality and showing us how our uniqueness is actually our strength and can be used as the key factor to insure our success. Explaining that the sub-conscious mind is in fact the “programming aspect” of our being, this book, through its vivid examples and colorful stories affords the reader many ways and opportunities to not only change one’s “conscious thinking,” but to actually “re-program” the sub-conscious over time, thus helping the reader to have a healthier, happier, more successful life. Joseph Giampapa, holding advanced degrees in Speech Communication, Theatre and Sociology, and over forty years experience as an Educator, Private Practitioner and Program Developer for the Private and Civic sector, has been hailed a leader in the field of “Self-Actualization”. Owing much to the large Chicago Italian family from which he came, he learned early on, the power of love, cooperation and caring for one another.